On June 15, 2012 Buena Vista Street opened up, giving Disney California Adventure the same feeling as walking down Main Street USA at Disneyland. Buena Vista Street imagines Walt and Roy arriving in California in 1923 to start their business making animated motion pictures. At the end of the street, the dream is realized in the edifice of The Carthay Circle Theatre, where Snow White and the Seven Dwarfs premiered in 1937. 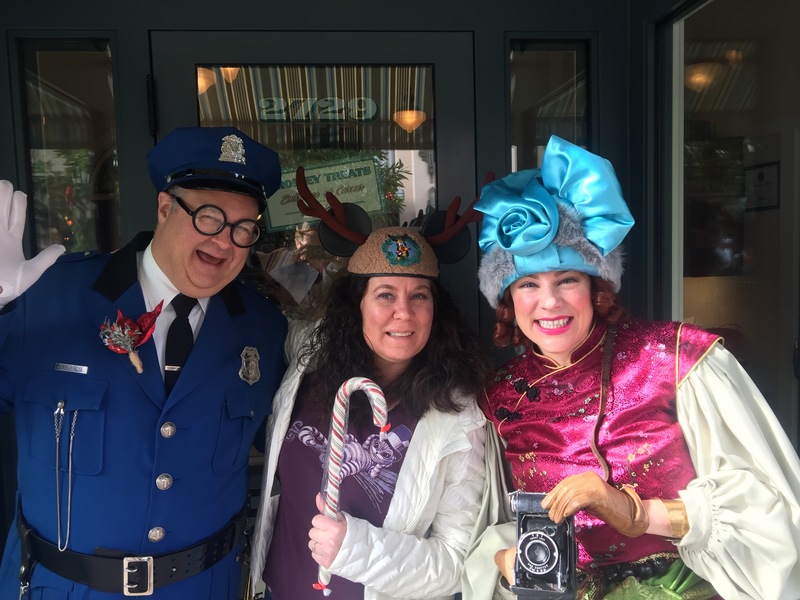 Stroll down Buena Vista Street and watch them make candy at Trolley Treats, listen to Five and Dime perform some great tunes of the era, or meet some of the area's denizens. The current entertainment guide (available at the front gates, information centers and from custodial cast members) lists them as Citizens of Buena Vista Street and says, "Keep your eyes open for these eccentric citizens—who live work and play on Buena Vista Street—and can't wait to welcome you to the neighborhood!" This summer they are available to meet and greet from park open to 6:00 p.m. They stroll up and down the street, and even venture into Hollywood Land, and often linger near the Elias & Co. department store. The unofficial mayor of Buena Vista St. Donna Linn (no hyphen) De Larria (pronounced with a rolled R) and her lovely companion, Lady. Photo by Todd Pickering. 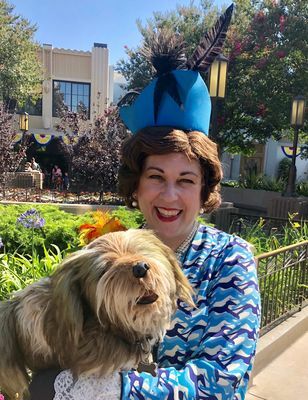 Donna is the unofficial mayor of Buena Vista St.. You usually see her with her dog, Lady. The kids love to meet the dog and pet her of course. She is happy to give you directions to any attractions. She is also happy that women just got the vote and has no plans on running for actual mayor as she is quite content with her unofficial title. When asked how she got that title she said that she brings cookies to all the meetings. The interaction with these fine folk is delightful, and they have an answer for absolutely any question you could throw at them. Since she was so loquacious she told of all her fellow citizens, where to most likely find them, and even let us know that a game would be played soon after the Red Car Trolley boys performed, which brings us to our next citizen: Molly the Delivery Girl. 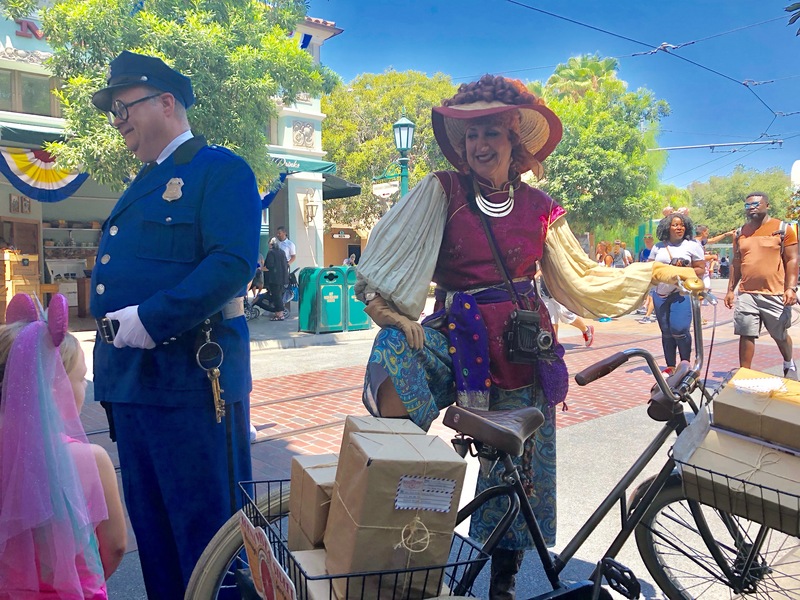 Sisters Millie and Molly deliver packages to the fine folks of Buena Vista Street. Photo by Todd Pickering. Sometimes you can get lucky and see both Molly and her sister Millie in the neighborhood. Molly (or Millie) are in charge of the Buena Vista Street Messenger Service, and you can see them riding around on a tricycle full of packages. If you are lucky you may even get a telegram delivery from one of them. 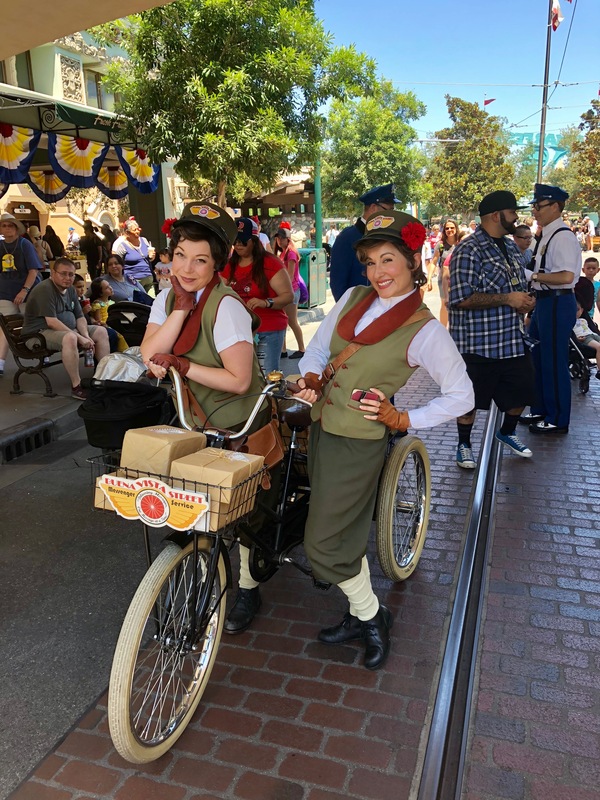 They have been known to ask you your name, and she might find that she did indeed have a telegram for you from Mickey Mouse himself! Getting a souvenir like that is pretty impressive especially for a younger visitor touring the parks. 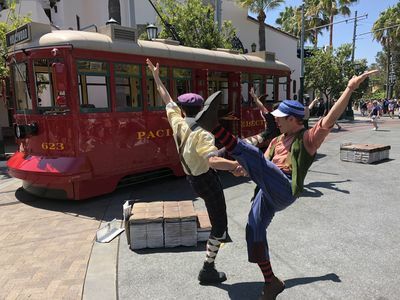 The Red Car Trolley Boys perform about six times a day, and Millie or Molly can be seen making a telegram delivery to the very famous Mouse himself in each show. The clever use of the delivery girl in the show really supports the theming and makes Buena Vista Street feel like a true neighborhood. 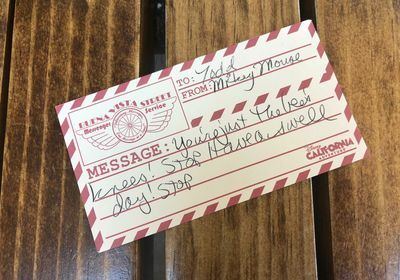 A telegram delivered by Molly or Millie written to you personally from Mickey Mouse may be the most precious souvenir ever. Photo by Todd Pickering. 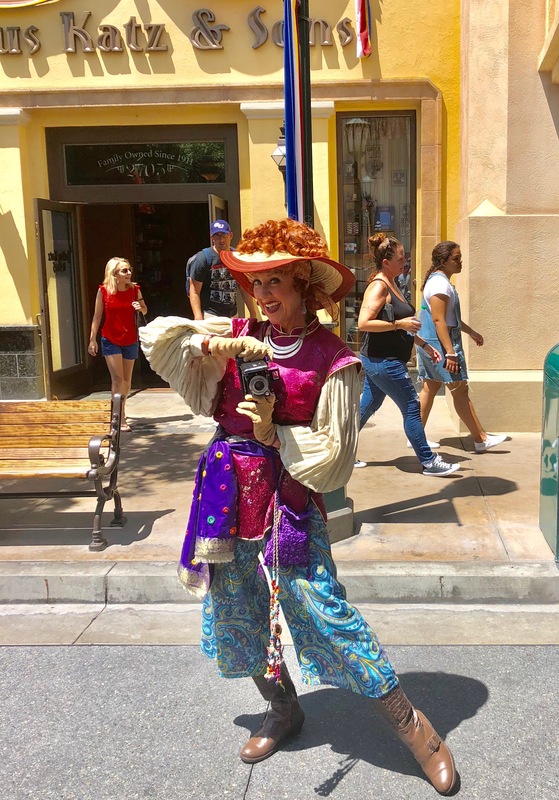 Molly makes a cameo when the Red Car Trolley Boys perform on Buena Vista Street. Photo by Todd Pickering. Officers Calvin and Clyde Blue always have smiles on their faces. Photo by Todd Pickering. Probably the most high profile Citizens are the Officers Blue. Brothers Calvin and Clyde work the beat on Buena Vista Street, and they are very apt to give out citations. Don't worry at all though, because those citations are always for good behavior like "Best Smile" or "Lending a Helping Hand." Officer Calvin explained that the police force believes in positive reenforcement. When asked about all the keys he carries he said they were for the Chamber of Commerce, his bicycle lock, he forgot, the jail (but they never use it and just keep supplies there), and the key to his Mom's house. Their mother is the Chief of Police and Officer Clyde said that he has been wearing that outfit since he was a tot as he was always groomed for policing. He was also keen to point out the architecture and shops of the neighborhood. These may be the best smiles in both parks! Phiphi Farouk Francis is a world traveler and photographer. Photo by Todd Pickering. Phiphi is the only citizen that leaves Buena Vista Street, since she is a world traveler and always has her camera on her. She has a magazine called "World Traveler" where her amazing photographs appear. She is happy to take your snapshot, but it might take some time to develop it since it isn't one of those new fangled cameras she keeps seeing up and down the street. She even claims to have invented the Self-Phi. Get it? Self-Phi...selfie...remember everyone that this is a different era when Vaudeville was king and these jokes are as good as they get. Tracey Pickering gets a great holiday photo with Officer Blue and Phiphi. Photo by Todd Pickering. Molly and the gang head to the monorail bridge to play games with the visiting children. Photo by Todd Pickering. The whole gang met up after a performance of the Red Car Trolley Boys in front of the Carthay Circle Theatre. As the Red Car Trolley pulled away with Mickey Mouse and the boys singing "California Here We Come," Molly waved good-bye. 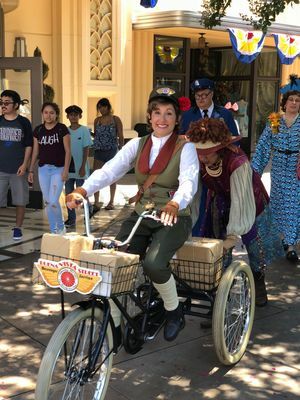 Donna had taken Lady to the dog groomer and along with Officer Blue and Phiphi pushing Molly's tricycle to help her take a break from pedaling, the entire entourage headed back down Buena Vista Street. They stopped under the shade of the monorail bridge halfway down the street. This show was not listed in the entertainment guide as it is more of an atmosphere performance. 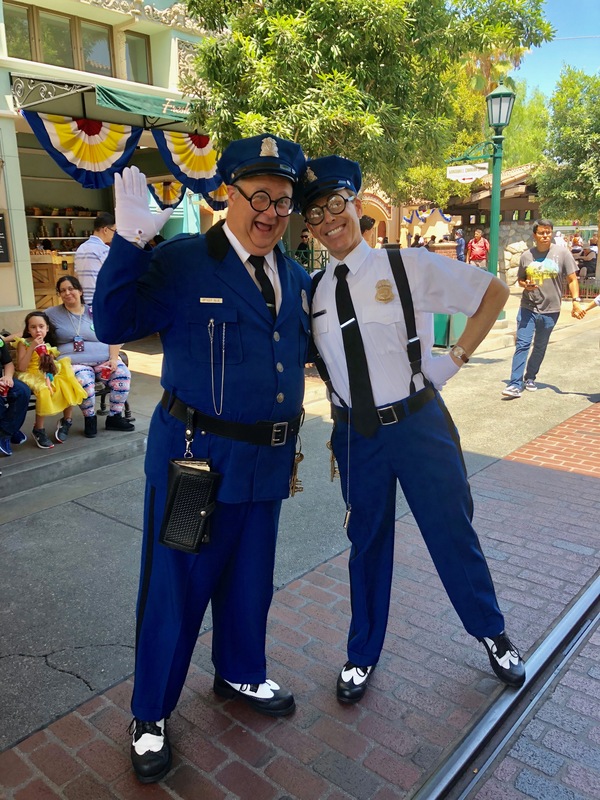 Officer Blue and Phiphi root on the kids to break a Buena Vista Street record. Photo by Todd Pickering. The citizens were taking volunteers of children to help them break a record of package passing. The children formed a line next to Molly's tricycle and then passed the package down to the end and placed it in the basket. Molly gave all the instructions in her booming and perky voice. Donna timed them on her wristwatch, and along with encouragement from Phiphi and Officer Blue they kept getting faster and faster until they broke the record for fastest delivery crew. After they were done performing, Officer Clyde and Millie came out and the whole gang stuck around for what they do best: pose for pictures. This is probably one of the only times to see the whole gang together, and they work beautifully off of each other. The look on the children's faces was priceless; it means so much for them to be part of something and meet with real Disney characters. 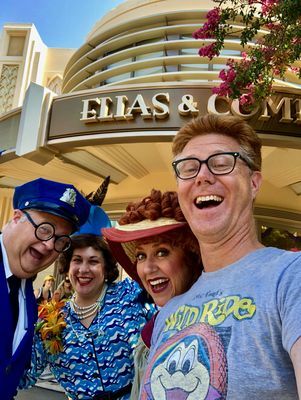 These people do not have the recognition of Elsa, Goofy, or Minnie Mouse, but the energy and excitement they bring to children and adults alike just shows that there is nothing like live entertainment. Talented performers, wonderful theming, and amazing costumes are what Disney does best. This makes the Disney experience a notch above the rest. It even inspired a last minute Self-Phi before they head off to meet more visitors in their fantastic neighborhood. Posing for pictures is what you see the Citizens doing the most. Photo by Todd Pickering. The Year of the Dog is a Hit!